Online experience retailer RedBalloon has announced its new CEO as Nick Baker, former Tourism Australia CMO. Baker will take over from Kristie Buchanan on Monday, 16 March. Baker told Marketing he was excited to step up into a CEO role in the entrepreneurial local company, drawing on his experience in the travel and tourism industry. 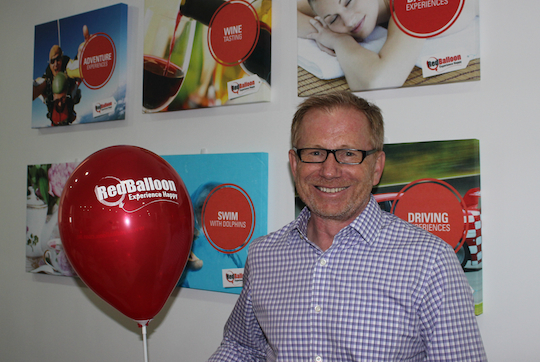 RedBalloon, owned by founders Naomi Simson (of recent Shark Tank fame) and Peter Simson, connects customers with fun experiences – from hot air balloon rides to sailing and race car driving lessons – through its website. “I got a telephone call, then the whole thing happened pretty quickly that I met up with Naomi and then Peter,” Baker told Marketing. “I was attracted because it’s a very entrepreneurial company, it’s got a great brand, got great recognition, stands for something, and that notion of experiences is something I’m closely aligned to with what i’ve been doing in the travel and tourism industry for many years. In Marketing’s recent feature following Baker’s resignation from TA, he told us that he was open to opportunities from different industries. In the end, RedBalloon’s similar-yet-different offer was too good to refuse. “I’ve been always in the travel and tourism side of things, and its obviously something that I know, but I certainly wasn’t afraid of moving out of the tourism industry. I was quite excited about doing something a little bit different,” he says. Baker’s past work in the hotels industry, coming up from operations into sales and marketing, will stand him in good stead to step up from CMO to CEO. He recognises the CMO to CEO transition as an interesting change occurring recently, as more organisations take customer-centric approaches. Baker will need to adjust to a change in business models, from Tourism Australia’s large brand campaigns and platform-building to RedBalloon’s focus on sales metrics and clearly defined goals (it’s aiming for ‘5 million good times by 2020’). But he points out that his background has prepared him well. “It’ll be a change but it’s back to what I used to know, because I’d been in hotels sort of all my life before I was with TA – I was director of sales with Voyagers and Renaissance Hotels. He plans to start out by getting a strong understanding of RedBalloon and how it operates before identifying opportunities and making plans. Baker will work alongside RedBalloon’s new chair Ken Boundy, also formally at Tourism Australia as managing director. Boundy’s brings perspectives on consumer marketing from the wine, food and tourism industries and is a strong advocate for getting the most from the rapidly evolving digital economy.